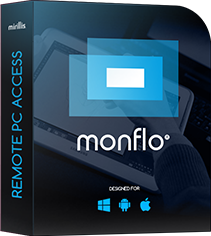 With Monflo Remote Control Software you can run and play every PC game on your Android device in outstanding HD quality. Please follow this tutorial to learn basics about playing PC games on Android devices. Monflo automatically switches to Game Control mode when fullscreen PC game is detected and displays a game control layout. TIP: If Monflo Client app does not automatically switch to Game control mode you can manually switch mode. Open Monflo Menu and select Switch to Game Control. Monflo Client app includes game control layouts manager that allows to quickly preview layouts, assign layouts to games and fully customize them. Monflo Client app provides a set of default game control layouts. For the best experience it is recommended to adjust or fully customize a layout for your PC game. Please open application Menu and select Game Control Layouts manager. Game Control Layouts manager provides a list of default layouts. Find a layout that suits the best to your game and hold a finger for a while to show Layout options. Duplicate layout. We recommend to use your PC game title as a name for a new layout. Select your new layout, tap Apply to assign this layout to your PC game and then tap edit button. With layout editor you can move buttons, change its size, assign new key or mouse events, remove and add new buttons and controllers. Customize your new layout to match it for your PC game needs. Tap Accept and then tap Apply. Play a game, check if it suits your needs and use Layout editor for further adjustments if required.